This past week has been just all GO! 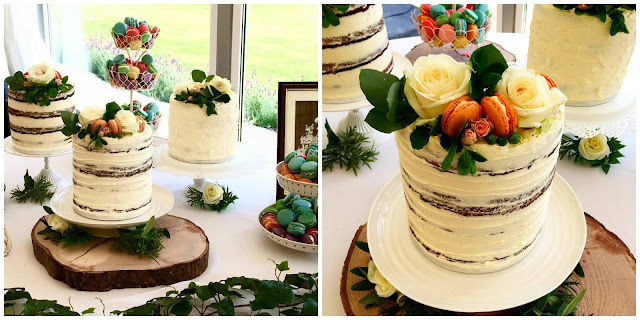 Two of our very good friends got married and trying to fit three layer cakes, 350 macaron and a Great British Bake Off post into my schedule alongside starting in my new school, being a Momma, wife and blogger was a big challenge. But a challenge accepted openly! First up, George and Lisa have been together since forever and yesterday, they tied the knot in a beautiful ceremony and full blown day out. I was honoured and entrusted with making the wedding cakes. That's right... CAKES! These folk know what they like and I was going make sure they got what they wanted. The vintage style of the venue lent itself perfectly to the semi-naked, naked cake trend so popular these days and I was only too happy to oblige! There was Red Velvet, Carrot and Walnut and Lemon and Blueberry in the three cakes. We colour coded the macaron with the pastel rainbow colours of the invitation. Each colour had it's own flavour. lemon, lime and coconut, blackberry, damson plum and vanilla, cookies and cream and finally orange blossom. After a total of 20 hours of baking... Can you guess where this post is going.. I am so SLEEPY!! Before I even got started on the wedding cakes, the Great British Bake Off and the Great Bloggers Bake Off needed to be sorted out. Finding myself with some *spare* time on Tuesday and knowing the Bake Off was Classic and Cake week, I opted for a simple, yet incredibly effective Victoria Sponge with some pretty trimmings! Worked a charm, went down a treat and I didn't get one photo of the inside! Taking that as a success!!! 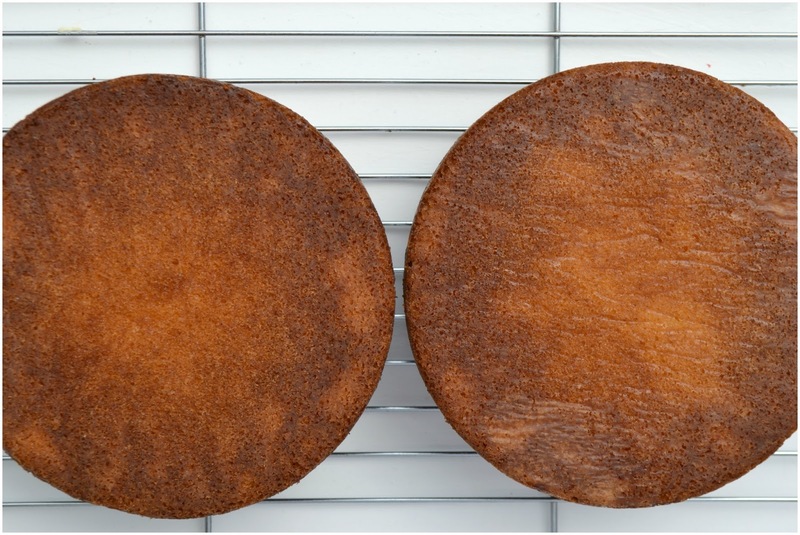 Line and spray two 8 inch round baking pans and leave to one side. Turn your oven to 180C/350F or Gas Mark 4. 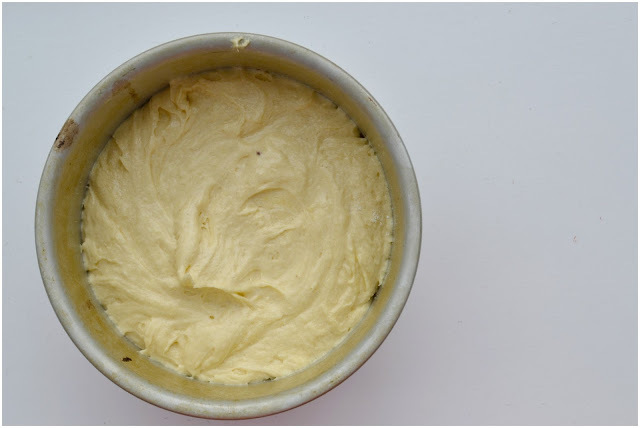 Dry whisk the flours and baking powder together. Or sieve them together. Add the eggs into the butter/sugar mix, one at a time and mix until the yolk has disappeared. Repeat for the other 3 eggs. Scrap down the sides of the bowl as you go. Add half the flour to the mixture, then the milk and then the rest of the flour, just mix until combined. Divide the mixture between your two tins and pop into a pre-heated oven for 25 minutes or until golden on top or your cake tester comes out clear. Allow to cool in the tins before turning out onto a wire rack. 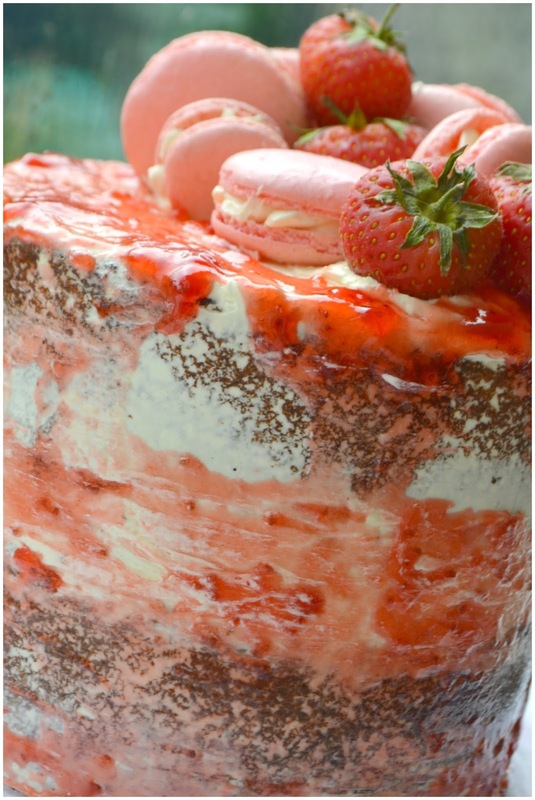 I layered my cakes with vanilla buttercream and strawberry jam.. I tried to do a fancy drip.. thing.. with the jam on the top but ended up messing the whole shebang up and just smoothed it around the edges instead!! Still tasted pretty damn good! And if you have stayed here through all of that, I hope you don't feel as tired as I do. haha.. It's a good tired though, the one where you know every second was worth it. The smile on the Bride and Grooms faces as they walked in and saw the table.. Nothing will beat that feeling!! 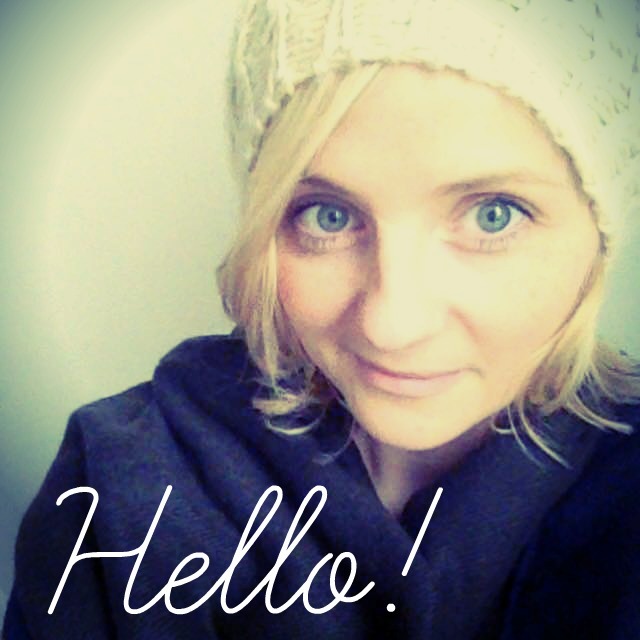 As for the Blogger Bake-along, the fab Jenny over at Mummymishaps, is coordinating all of us again this year! The season set itself up to be a good one last Wednesday. I hope you'll join in as we go bake alongside the tent! Next week is biscuits... Gosh I love a good biscuit! well just astounding! your cakes are beautiful and i bet they tasted amazing too. 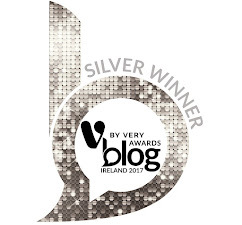 it is not surprising you have been shortlisted for that Irish food blogger award, have you heard any more on that yet? Nothing as of yet Jenny.. would keel over if I made it to the finals but lets get through the bloggers bakeoff while we're waiting!! The cakes all look amazing and just look at those macaron! You are a talented lady, that is for sure! Thanks Carlee, high praise from a fellow talented baker! Those wedding cakes are stunning Hazel! 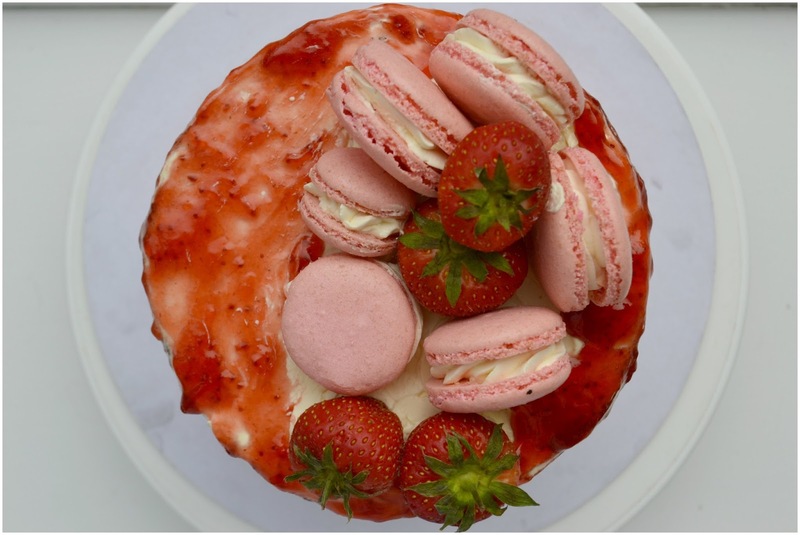 I never even knew there was a bloggers bake off... I made drizzle cakes and Jaffa cakes this week! now there you go Gina and I see you've linked up.. My job is done! ha! The snooze button was hit at least 5 times this morning Angela! Loads of sleep had! I love thenaked cake look... fondant is not my thing but buttercream, yum! Give me more of that any day! I love the jam drizzled over your victoria sponge. What a great idea - finger licking good I bet too. The wedding cakes you made are nothing short of stunning too. Wow those wedding cakes are stunning :) The Victoria sponge looks delicious as well! Thanks Michelle.. I was very pleased with myself! Yeah I liked that too Lucy.. a nice mistake for sure! 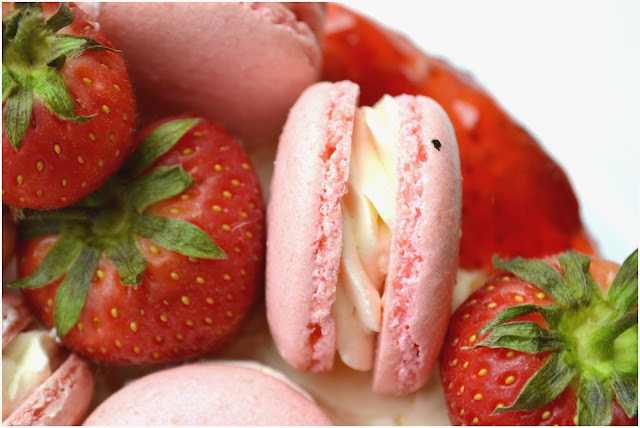 Oh my so beautiful - and I love the pink macarons on top!